If you are looking for a versatile, inexpensive camping quilt, take a look at the Go-Anywhere Blanket from Tribe Provisions. This blanket not only makes a great summer throw, it rivals the ubiquitous military poncho liner in terms of versatility and is a great option as a base for converting into a top quilt and under quilt for hammock camping. The Tribe Provisions Go-Anywhere Blanket is a simple, rectangular quilt with sewn-through construction, which makes a pattern of squares on the outside fabric. The includes stuff sack is permanently sewn onto one side. The blanket features nylon fabric on one side and polyester on the other. The edges only looked double stitched to me, although the third stitch could be tucked inside. 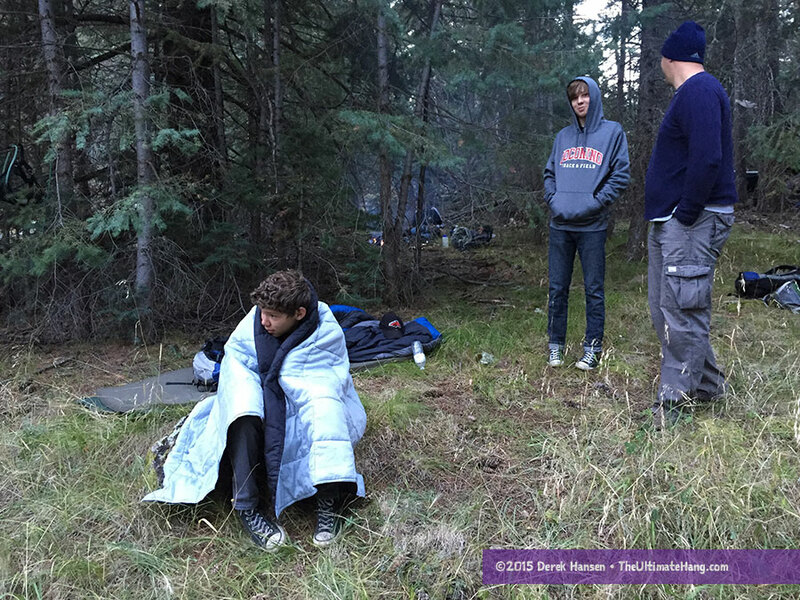 Tribe Provisions was very intentional about the fabric and construction of the blanket, trying to find a good balance of high-durability and performance for an outdoor recreational “go anywhere/do anything” blanket. To that end, I think they succeeded. It’s a gear item that works equally well as an all-purpose take-along, to a specific use item. My immediate impression of this blanket is that it is perfect for hammock camping, not only as a great summer top throw, but with a little DIY elbow grease, a great base point for a convertible top and under quilt. The company doesn’t provide a temperature rating for this blanket, but based on the materials, thickness of the insulation (between 0.5 and 0.75 inch/1.27 to 2 cm), and my own experience, I would give it a 50°F (10°C) comfort range. I’ve used the blanket down to 45°F (7°C) and was comfortable. 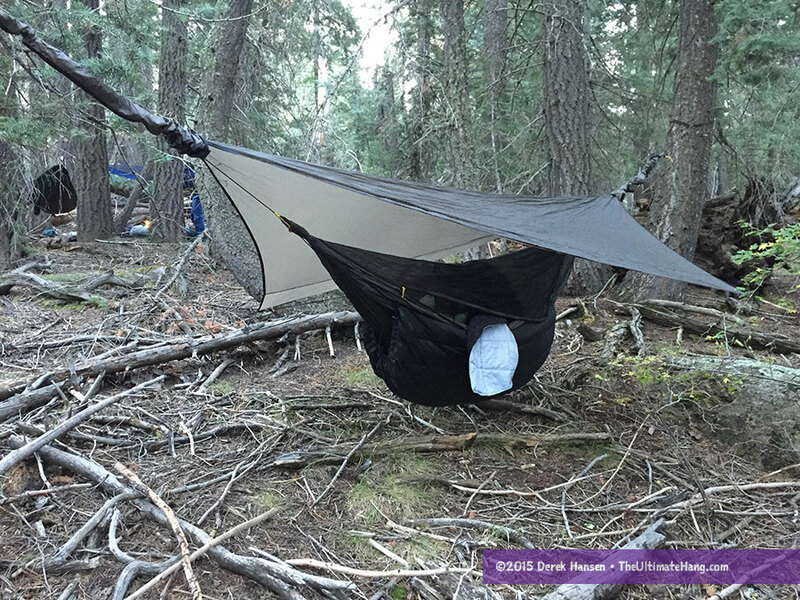 A bit of the Go-Anywhere blanket is peaking out of my hammock on a recent backpacking trip. Because of its simple construction and build, the blanket can be used in any number of ways: as a liner to boost the performance of another quilt or sleeping bag, emergency essentials, car camping, a summer insulator, or wrapping up around camp. By itself, it worked okay in my hammock, but I found that I wished it had a foot box to tuck my legs into. I like quilt-style bags in a hammock because it is much easier to get in and out and to tuck a quilt around you, but it’s a little harder to keep my feet “tucked in” if I kicked a knee out. In the hot summer, this “venting” option is great! I certainly haven’t had any issues in all my indoor testing, but out in the field when the temperature is more variable, it is nice to have some security around my legs. The good news is that it is easy to modify this bag and turn it into a modular workhorse. Adding a few snaps around one end quickly creates a foot box. Adding some bias tape and grosgrain webbing on the corners and edges can turn it into a bottom quilt. Tribe Provisions distinguishes the nylon and polyester fabrics by both feel and performance, but my hands have a hard time telling a significant difference between the two, at least any perception that strikes me. The nylon does feel slightly stiffer, perhaps, but I don’t mind having either against my skin. It’s not a smooth or subtle as some other synthetics, but it is comfortable enough—not too “plastic” feeling. If the nylon is ripstop, I can’t see it. Both sides appear smooth. I like how the stuff sack is attached from the inside. This means it turns inside out when the blanket is unstuffed. Still, I think the sack is annoying as it dangles from one side. To me, it gets in the way. I wish the stuff sack were constructed more like a hidden pocket, sewn along the baffles, so it could double as a little storage pocket for a light or cell phone when the blanket is used. So while I like the concept of an attached stuff sack, the execution is just a little off for me. The stuff sack snags on things and changes the aesthetics of the blanket. The price is nearly unbeatable. MSRP from the manufacturer is only US$30. For me, this blanket rivals the comfort, durability, warmth, and modularity of military poncho liners at this price. As such, it makes a great option for converting into a top quilt or under quilt for hammocks, or just using as-is. For continued use in a hammock, I’m definitely going to add some snaps and run some shock cord to make this into a convertible top and under quilt. At this price, I may just buy a few to use as general use quilts. This is a great blanket for cost-conscious and value-conscious buyers who are looking for insulation options. It’s great for DIY-ers who are looking for an inexpensive base layer to create top or under quilts. I would be curious to see how it compares to the Snugpak Jungle Blanket? I haven’t reviewed the jungle blanket, so I can’t speak directly to it. If it has synthetic insulation it is probably comparable. A lot of folks have seen inexpensive 700 fill power down quilts at Costco recently for $20! Those would also make great DIY options for hammock quilts. What does it take to add a foot box to a blanket? Basically, get some snaps and add them to the bottom about 18 inches. Sew a strip of grosgrain or bias tape ribbon across the end with a shock cord and cord lock to gather up the end. I just wanted to thank you for all the great information you send out on the art of the hang. I moved to Hawai’i in my early twenties and made my home in a Viet Nam jungle hammock.. Now Im back 50 years later and purchased a Hennessy and am loving it for camping on Maui. Best to you. Keep the great info coming. Hello! I am new to hammock camping, and I have an Eno Junglenest and the Ember under quilt. Do you think this blanket would work in that combo for a top quilt in ~32 degree weather? I’m trying to find an affordable top quilt. Thank you! You would need to layer some clothing. For really warm sleepers, perhaps. Another inexpensive option is the Double Black Diamond down quilt at Costco. If you have a membership, those quilts are going for about $20. Put two together and you’d be fine to 32°.